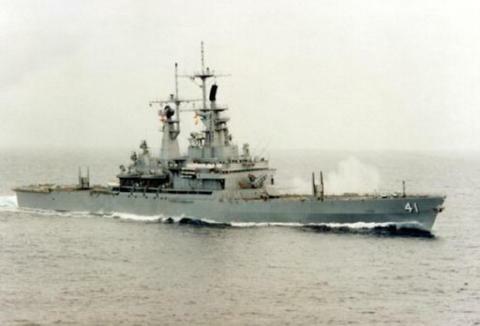 The USS ARKANSAS (CGN-41), a Virginia class cruiser, was commissioned on 18 OCT 1980. Built in Newport News, Virginia at Newport News Shipbuilding, USS ARKANSAS underwent extensive fit out and shakedown training in Hampton Roads and the VACAPES operating area. In early 1981 ARKANSAS sailed to Puerto Rico and returned for final fit out prior to underway qualifications and certifications. In April 1981, USS ARKANSAS stood out of Norfolk for the Caribbean and South Atlantic. Upon her return in June 1981, USS ARKANSAS spent the remainder of the year undergoing maintenance pier side. The first nine months of 1982 were spent in training, maintenance and exercises in the Caribbean, before she departed on her first and only "Med" in October. In May 1984 USS VIRGINA changed her homeport to Alameda, California. The final fourteen years of her career was spent attached to the Pacific fleet, deploying to the Western Pacific and on to the Indian Ocean / Persian Gulf when called upon. USS ARKANSAS served her country for 17 years, 8 months and 19 days, until decommissioned on 7 JUL 1998. USS ARKANSAS was disposed of by 1999 at the Nuclear-Powered Ships Recycling Program at Puget sound NSY, Bremerton, Washington.